Cindy has released a staff training video: “Bringing Nurturing To Memory Care”. As a caregiver for a person with dementia, do you often find yourself frustrated by their behaviors, or are you at a total loss at how to persuade them to do something you need them to do? 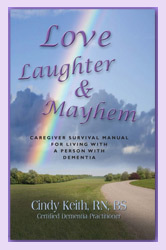 "LOVE, LAUGHTER, & MAYHEM - Caregiver Survival Manual For Living With A Person With Dementia" will help you learn ways to decrease your frustration, as well as offer many tips on how to navigate around obstinate behaviors. Click here to view sample chapters and the Table of Contents for this valuable resource. Andrew Rosenzweig MD, MPH "Having read Cindy Keith's first book, "Love, Laughter, & Mayhem - Caregiver Survival Manual For Living With A Person With Dementia," I was impressed with her down-to-earth and practical advice to family caregivers. This second book by Cindy is equally impressive in the ways she understands the challenges faced by workers in facilities every day. 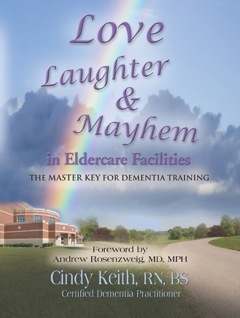 Cindy tells it like it is... ; "LOVE, LAUGHTER, & MAYHEM IN ELDERCARE FACILITIES: THE MASTER KEY FOR DEMENTIA TRAINING" Cindy's second book, will help you learn even more ways to decrease your frustration, as well as offer many tips on how to navigate around obstinate behaviors. Click here to view sample chapters and the Table of Contents for this valuable resource. "Cindy will always have a special place in my heart. She has the knowledge and a true love for the elderly to help us provide the best possible care for our parents. I hope you will allow her to use her knowledge and love of the elderly to care for your parents." My mission is to serve you with integrity, to nurture your spirit, and to help you allow humor into your life, while I give you the tools to live and work in the world of dementia. To be the most compassionate and helpful source of guidance and information to families and facilities dealing with loved ones and residents with any type of dementia. © 2018 Mind in Memory Care. All rights reserved.